If you’re looking for a one-stop shopping experience, great customer service, and highly-rated products with higher weight limits, consider a Zupapa trampoline. Depending on what you’re looking for, there are two different types of trampolines that Zupapa offers. The first option is the outside enclosure net model, where the net is outside of the safety pad. 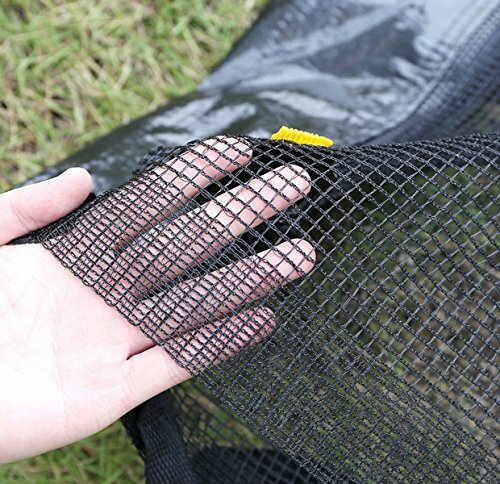 The inside enclosure net type simply means the net is inside the safety pad. Frame Diameter: Corresponds with model size (12, 14, or 15 ft). Age and Weight Limitation: Weight limits are 330 lbs for the 12 and 14 ft; 15 ft is 375. There is no age specified by the manufacturer, but we’d recommend this product for children ages 6 and over. Because of the higher weight limits, this trampoline is especially appealing for families with older children. Also, while we don’t endorse multiple jumpers, many customers like the 14 or 15-foot Zupapa trampolines because they allow more space for more children and have the weight capacity to support them. It’s important to note that the enclosure net poles feature a 10mm high-quality blue foam that can protect jumpers from hitting a hard pole. Additionally, the enclosure net is actually a bit taller than most other brands and offers additional protection. Zupapa is the manufacturer of these trampolines. They are based in Germany, which means their products undergo many tests for safety and quality. Zupapa trampolines are approved and certified by TUV, which is a German translation for Technical Inspection Association. This means they have undergone strict inspections and certification for quality, durability, and safety by the TUV to ensure that their trampolines are safe for humans and the environment. TUV certification ensures the utmost safety, which deems this as one of the safest products on the market. What’s Included in the Shipment? The delivery arrives in 3 boxes in 3-5 business days. Some customers have noted missing parts, but most report that they received all packages and pieces in this time frame. Even if parts were missing, buyers noted that Zupapa’s customer service was prompt in providing the parts quickly. Overall, customers are pleased with the safety of the product. One purchaser noted that her child with Downs Syndrome loved the Zupapa trampoline and fully endorsed the safety of it. Only a few reviewers noted the safety of the product could be compromised because of wear of the product over time (torn mats, enclosure nets, broken springs). However, with manufacturing and warranty improvements in 2018, this problem should be averted. Most reviews are positive, and rave about the quality and durability of Zupapa trampolines. There was also a handful of complaints about damage of materials after a short period of time after purchase. Comments included poor quality of springs, safety net, safety pad, and the jumping mat. Fortunately, Zupapa changed their manufacturing in 2018. This resulted in an upgrade to hot-dip galvanizing process, as well as UV-absorber UV9 to extend the life of the life of the pad mat and net. Because of these manufacturing changes, the warranty on Zupapa trampolines has been extended to 10 years for the frame and 2 years for the mat, pad and springs. Combine this with the top-notch customer service that customers discuss, Zupapa trampolines offer a quality and durable product that is backed with one of the longest warranties in the business. Customers reported that they put the trampoline together in 1-3 hours, and that the process is relatively easy. The biggest complaint was that the instruction manual was difficult to read. 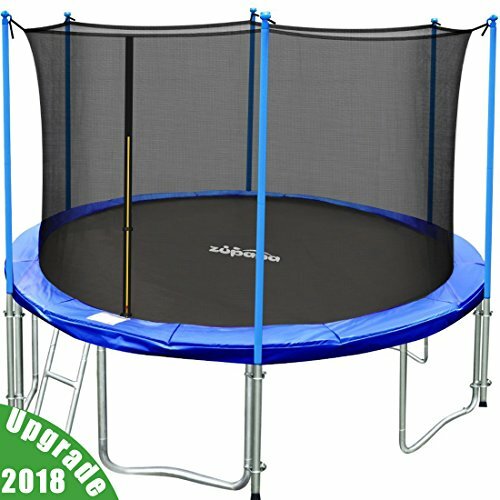 However, Zupapa now offers step-by-step assembly videos on their website for all trampolines they sell for those of us who prefer a visual example. Zupapa trampolines are available to purchase directly from Zupapa.us, Amazon, and Walmart.com. Prices range from $399-$499, depending on the size of trampoline. To receive VIP pricing directly from Zupapa (which is comparable to Amazon’s lower prices), simply create an account to register as a customer. Each option offers free shipping, but if you order directly from Zupapa. However, they do not currently ship to Alaska or Hawaii. Replacement parts are available on the company’s website, Zupapa.us. Some parts are available on Amazon, but those on the manufacturer’s website are actually much cheaper. According to Zupapa, using the rain cover that is included can help prolong the life of the trampoline when you’re not jumping. Keeping your Zupapa trampoline covered — even when the weather is not wet — can help protect it against dust, dirt, and UV damage. Zupapa also recommends washing the trampoline off with a hose roughly every other week to keep it clean, and storing it during harsh weather when it won’t be used for a while. Considering the strict TUV certification standards that Zupapa trampolines are tested for, along with the high-quality German manufacturing, this is a great investment for your family. Zupapa took great strides when they upgraded their standards and warranties in 2018, which reflects on their intent to please their customers. You get a safe product, higher weight limits, and an all-in-one shopping experience. You have everything you need to get your jumpers on the trampoline within hours of delivery, and the peace of mind knowing that Zupapa stands behind their trampolines.